House's GOP Leaders Hit Turbulence Early : It's All Politics House leaders have hit severe turbulence as some of their fellow Republicans refuse to go along with legislative initiatives being pushed by Speaker Boehner and his leadership team. Meanwhile, Democrats have little to no incentive to help the GOP leaders. 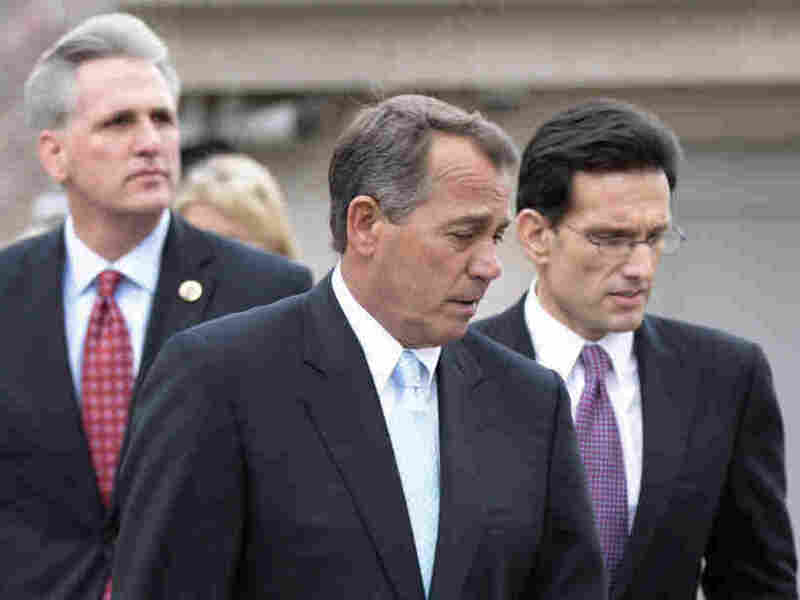 House Speaker John Boehner (R-OH) , center, with Majority Leader Eric Cantor (R-VA), right, and Majority Whip Kevin McCarthy (R-CA), Feb. 9, 2011. The emerging media narrative about the House Republicans' leadership of that chamber is that no sooner had Speaker John Boehner and his team gotten airborne, then they hit some fairly severe turbulence. Part of the problem for Boehner, an Ohio Republican, and his fellow leaders is a large GOP freshman class with a strong anti-authority streak. And some of those new Republican members feel little loyalty to the party since they were propelled into office by Tea Party activists. Also contributing to Boehner's challenges are Democrats who relish the chance to give him a taste of his own medicine. Still smarting over the unified Republican opposition to legislation that created the Obama economic stimulus and health care law, and ideologically opposed to much of the GOP agenda, House Democrats are readily casting their "no" votes. Thus divided government doesn't only describe the dynamic between the Democratic White House and Senate and the GOP House, but within the House chamber, too. For the second consecutive day, House Republicans on Wednesday lost a floor vote due to a mini-revolt, this time over a plan to demand a repayment from the United Nations. Earlier in the day, members of the party's conservative bloc used a closed-door party meeting to push the leadership to go well beyond its plans to trim about $40 billion from domestic spending and foreign aid this year, demanding $100 billion or more. It usually takes a lot longer for the party in charge to start with the finger-pointing, the failed votes and the backpedaling on campaign promises. But the House Republican majority has already had two failed floor votes, is experiencing a backlash on the right over spending cuts and has bypassed the committee process it once praised for taking up major bills. And that's all just this week. With a separate trade bill already pulled from the schedule, Republican leaders have failed to advance three of the five bills they had planned for the week. The sudden breakdown prompted a round of finger-pointing within the GOP upper ranks, along with barbs from Democrats who wondered if Republicans had forgotten how to count votes. Contrite senior aides acknowledged that Speaker John Boehner (R-Ohio) and Majority Leader Eric Cantor (R-Va.) had miscalculated the level of opposition from Democrats and from within their own ranks. One of dangers for Republicans is that once a narrative gets set, it can be hard to change. But shifting the current dynamics will be a huge challenge for Boehner and his management team. Getting enough votes even within the party that controls a chamber requires compromise. But many of the new Republicans were elected on a "no compromise" pledge. Even Boehner, at times, has seemed to make compromise a dirty word. Meanwhile, House Democrats have little to no incentive to help Boehner. With every Boehner failure to move legislation, Democrats will be he able to contrast their productive stewardship of the House with the Republicans. Meanwhile, if House Republicans can't move legislation that becomes law, President Obama will be able to paint them as a do-nothing legislature a la President Harry Truman in 1948. So to say Boehner has his hands full understates his problems.